Ever since the movie Dhoom released over a decade ago, a lot of people have been inspired by it. No, not the stealing part, but the stunting on the bike part at least. If you happen to live in Mumbai or have been on the roads late at night, you would have spotted a few bikers riding dangerously on Marine Drive, Palm Beach road, Eastern Express Highway and other such roads. 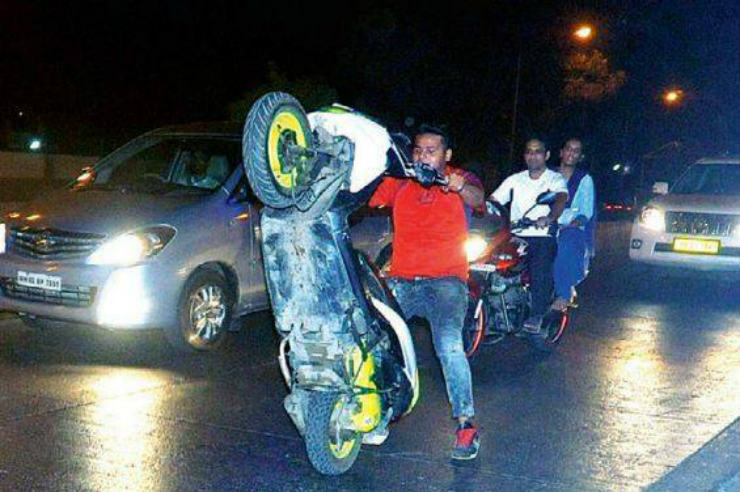 A lot of bikers have been performing stunts and riding rashly on public roads. This is very dangerous, not only for the riders, but the other road users as well. To begin wtih, most of them do not wear any riding gear (helmet/jacket/gloves), which means they are at a risk of injuring themselves. In addition to that, since they ride on public roads, any misjudgement on their part could result in causing damage, injury and even death to other road users. Not only that, they also have modified bikes. Now these modifications range from bright lights which can blind other road users to really loud exhausts, which disturb others. These mods are illegal, as they create more noise pollution and will be noisier than the 80 dB limit that has been set by the government. These people ride late at night, causing discomfort to the people who stay in the vicinity. Since they ride so late at night when there is less traffic, the noise from the exhaust is more prominently heard. Residents from across the city complained that these bikers were giving them sleepless nights and that it was making the roads unsafe. Last Sunday morning (3rd April), a bunch of 24 such bikers were caught for rash and negligant riding on the Eastern Expressway. The cops conducted a ‘nakabandi’ to catch such bikers who were creating a nuisance. Out of the 24 nabbed, one was a woman. There were regular complaints from residents residing around of bikers becoming a menace during the night. Hence, a nakabandi was conducted. When our policemen tried to stop them a few of them started heading in another direction causing a risk to their and others lives as well. The riders were booked under sections 279 (rash or negligent driving endangering human life) and 336 (endangering life or personal safety of others). While they were initially put behind bars, they have been released on bail now. But their bikes have been seized and the cops are checking with the RTO to see if modifications were made to the bikes and if they were legal or not. Riding fast or rashly is not safe on public roads due to the fact that anything can come out of anywhere, causing a crash. Since a public road is open to everyone, you not only put yourself at risk, but other road users as well. Diverts attention of other road users. Doing such stunts in public will catch the attention of other riders, who will wish to try the same as well. While you maybe a skilled rider, you may inspire someone else who isn’t one to try something like this. By this, you are setting a bad example to other road users. If you do wish to ride fast and perform stunts, there are enough private areas/tracks where you can showcase your talent. « ITBP dumps Gypsy, gets Scorpio 4X4s, & Snowmobiles too!